Both our gut and our brain originate early in embryo genesis from the same clump of tissue which divides during fetal development. 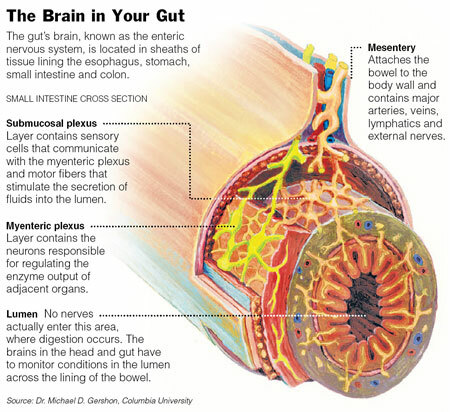 While one section turns into the central nervous system, another piece migrates to become the enteric nervous system. Later the two nervous systems connect via a cable called the vagus nerve — the longest of all the cranial nerves . The vagus nerve meanders from the brain stem through the neck and finally ends up in the abdomen. There’s the brain-gut connection. This means your psychological health, is partly derived from the heathy gut. When you have severe dysentry , have you noticed how depressed you feel? IF OR WHEN MY MIDDLE AREA IS UNWELL, MORE I FEEL TENSION, DISARRAY. YET, SOME OTHER PEOPLE ARE SO STRONG TO FUNCTION WITH A MESS AT THEIR CORE. via Ajit Vadakayil: GUT FEELING AND INTUITION — CAPT AJIT VADAKAYIL.